The first thing I found out about these shades is that swatching them on your hand does not give the best representation of what it will look like when on the face. When swatched, they appear really shimmery. Once blended though, a lot of the shimmer disappears. ModelCo say that these are designed to be worn together, but I feel that the combination is a bit too much. It can all look a bit too glowy, you don't want to go overboard and I think that can be easy to do by using all three at once. Individually though I think that these are all beautiful. 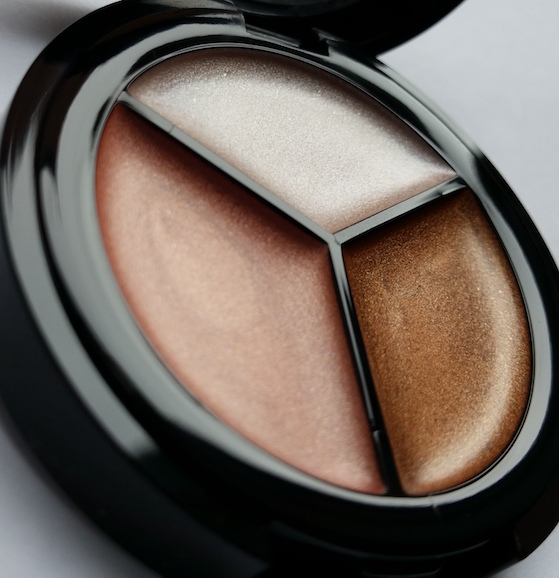 I'm not personally a fan of shimmery bronzer, but this is quite nice for adding a sun kissed glow if used where the sun would naturally hit the face. For contouring I'd suggest sticking with a matte finish bronzer. The blush shade leaves a happy and healthy glow on the apples of the cheeks for a rosy boost, but if used along with the highlighter you might look a bit too shiny. The highlight shade is my personal favourite. It is kind of reminiscent of Benefit's High Beam to me, but a little less shimmery when blended. 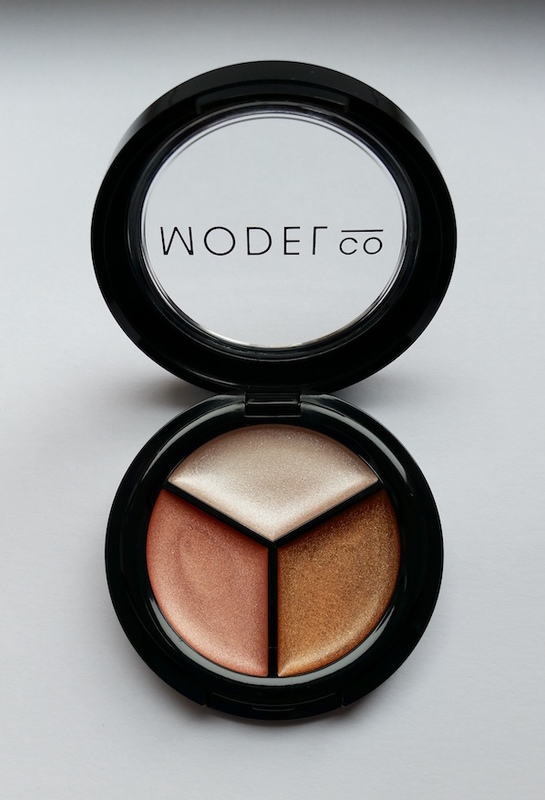 It does leave a luminous finish though, kind of in the middle of a matte highlight and shimmer highlight. I think that with practice, you can create some nice looks with this palette. Just think that if it feels too much, it probably is, and you should be good to go. Formula wise they are incredibly creamy, but I find that you need to use a fair amount to cover an area efficiently. It doesn't spread across the skin as easily as some products, but it does blend really nicely and dries quickly into a powder finish, which is the reason it can be hard to spread out over the face. Because of this, I recommend doing it a small bit at a time. It takes longer to get that highlight, but it's better than trying to blend it out too far and taking your foundation off in the process. Due to the small size of the pan, I've been using my pinky to apply it, but you could also use a small brush or the tip of a sponge if you wanted to try those methods. The longevity is also fab. I didn't need any top ups throughout the day with any of these. Overall, whilst I love each shade of these individually, I find them difficult to wear all at once. Each shade for their intended purpose though is great, and so for this I still recommend giving this palette a try. My favourite shade is the Champagne highlighter which I find perfect for a daytime highlight that isn't too in your face. If you're looking for something more glowy I would recommend checking out something like theBalm's Mary-Lou Manizer, but if you're after subtlety then I suggest that you try this. 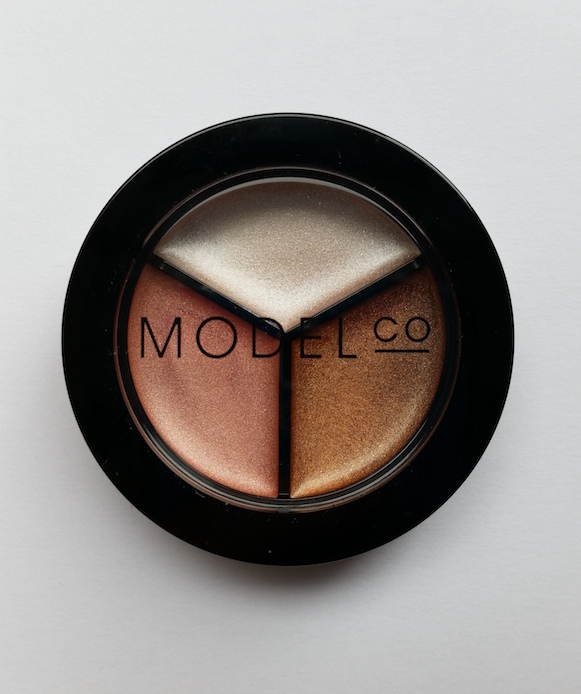 You can purchase the ModelCo Highlight Trio from Birchbox. What are your thoughts on the ModelCo Highlight Trio? What is your favourite face palette?